Tours depart at 4.30 pm from Tuesday to Sunday all year round. A tour at 3.30 pm is available daily from April to October and Tuesdays, Thursdays and Saturdays from November to March. From April to October there are morning tours at 8.45 and 9.00 am. Morning or late afternoon to avoid crowds. 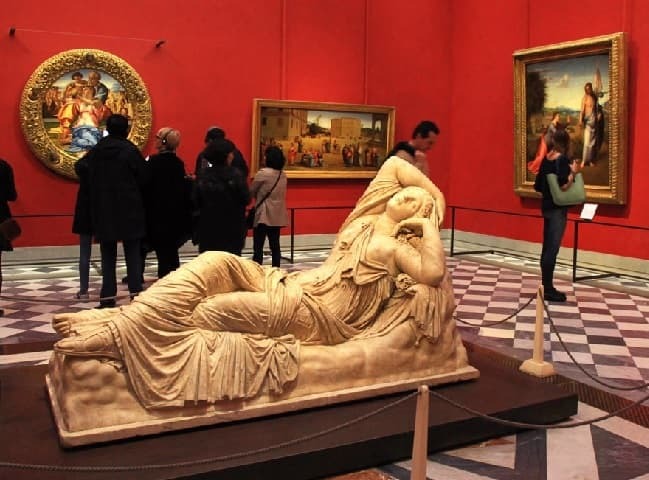 We are comparing Uffizi Gallery Ticket and Tour - Skip the Line Prices from leading ticket suppliers and Try to find you Cheap tickets prices on the market. The Uffizi Gallery one of the top things to do in Florence and should defiantly be on your wish list. Whether you're an art enthusiast, or, the names Michelangelo, Leonardo, Raphael, and Donatello remind you of 4 much-loved cartoon turtles, a visit to the Uffizi Gallery is a must while in Florence. Formally belonging to the Medici family, the Uffizi Gallery is now among the greatest art Galleries in the world with works dating from the Middle Ages to the 20th century. An expert guide will show you through grand halls and introduce you to famous pieces by Renaissance artists such as Titian, Giotto, Cimabue and Botticelli. Learn about the tools and techniques they used and how the movement developed in Florence, a city known as the ‘Birthplace of the Renaissance'. The tour will take you through Renaissance artworks, grand halls and exhibitions with time to stop and listen to your guide's commentary. The tour will end inside the gallery and you'll be free depart or to wander through the exhibitions independently. Aimed at history and art lovers, but novices can also enjoy this tour. The guide will help you understand the artworks and teach you about the artists. Great if you don't have time to wait in line. Your Experience With Uffizi Gallery Ticket and Tour - Skip the Line? Save yourself hours of queueing by skipping the line to one of Florence's top attractions. Tour the interior of the Uffizi Gallery with an art historian guide. Learn about the history of art, significant movements and revered Italian artists with a guided tour of the gallery. Benefit from the knowledge of your expert, multilingual guide. See the works of Leonardo da Vinci, Botticelli, Raphael, Titian, Michelangelo and many more. Spend the rest of your day touring the gallery independently or set off to visit other Florence attractions. What Uffizi Gallery Ticket and Tour - Skip the Line Includes? Uffizi Gallery Skip the Line entrance and 1.5 hour guided tour in English, Italian, Spanish, French, Portuguese or German. Headphones for groups of over 15 participants. Travelers Reviews about Uffizi Gallery Ticket and Tour - Skip the Line? The Uffizi Gallery is on the of the Top attractions to see in Florence according to TripAdvisor. This tour and ticket has 4.4-stars on Get Your Guide. It has 4.5-stars on Viator. It has 5 out of 5-stars on TripAdvisor. Comments say that the gallery guides are excellent and experienced and that it is not worth visiting the gallery without a guide. Cancellations should be made at least 7 days in advance to receive a full refund, cancellation fees may apply for late cancellations. Ticket in print or mobile form. Meeting Point:Door No. 1 or 3 (please check reservation), Uffizi Gallery, Central Florence.